India's per capita income rose by 5.2 per cent to Rs 12,416 (about $285) during 2004-05. According to the Central Statistical Organisation estimates, the per capita income during 2003-04 (Quick Estimates) stood at Rs 11,799. 'The per capita income in real terms (at 1993-94 prices) during 2004-05 is estimated to attain a level of Rs 12,416 as compared to quick estimates for 2003-04 at Rs 11,799,' the CSO release said, adding that the per capita income growth rate during the 2003-04 was 7.1 per cent. 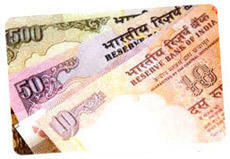 India’s per capita income rose by 5.2 per cent to Rs 12,416 (about $285) during 2004-05. ‘The per capita income in real terms (at 1993-94 prices) during 2004-05 is estimated to attain a level of Rs 12,416 as compared to quick estimates for 2003-04 at Rs 11,799,’ the CSO release said, adding that the per capita income growth rate during the 2003-04 was 7.1 per cent. "The real issue is not where China and India are today but where they will be tomorrow. The answer will be determined in large measure by how well both countries utilize their resources, and on this score, India is doing a superior job," the duo said in the report published in 'FP', a magazine published by the Carnegie Endowment. “The real issue is not where China and India are today but where they will be tomorrow. The answer will be determined in large measure by how well both countries utilize their resources, and on this score, India is doing a superior job,” the duo said in the report published in ‘FP’, a magazine published by the Carnegie Endowment. Indian Cyber Law does not deal with Blogging. Blogging is the latest craze on the internet and bloggers are known to express themselves to the world at large without fear of being identified. Blogging is about a netizen’s right of expression on all kinds of subjects – the mundane to highly-specialised subjects. However, this freedom is beginning to be taken for granted and today it’s used for legitimate as well as criminal purposes too. Here’s an example of an unwarranted purpose for blogging: Blog in the name of a known identity. People are likely to confuse messages posted on the blog as the online identity of the well-known and this can have telling effects. However, when one examines the law in this regard, one realises that the law has not developed in this area. There are therefore very few effective remedies, especially because blogging sites are located outside the country and are out of reach. The US-based IBM, the world's largest IT company, plans to increase its payroll in India this year by more than 14,000 workers, even as it cuts 13,000 jobs in Europe and the United States, The New York Times reported on Friday, quoting an internal company document. Marcus Courtney, president of the Washington Alliance of Technology Workers or WashTech, told the daily: "IBM is really pushing this offshore outsourcing to relentlessly cut costs and to export skilled jobs abroad." You are currently browsing the Free to share your thoughts blog archives for June, 2005.